The Smena 8 was a plastic-bodied 35mm Viewfinder camera made from 1963 to 1971 by the LOMO company in Leningrad (now St. Petersburg), Russia - one of a series of Smena cameras. 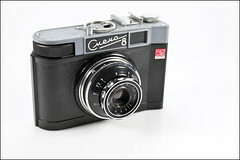 The Smena 8 is actually a modernized Smena 6 with a film rewind knob added (Smena 6 used two cassettes system); sadly, as opposed to the Smena 8m, the Smena 8 does not offer choice of working with one or two cassettes. It is fitted with a 40mm f/4.0 lens called T-43. Shutter speeds are B, 1/15, 1/30, 1/60, 1/125, and 1/250 sec, with flash synch (at all shutter speeds for electronic flashes, while 1/15 sec and B for flash bulbs). The shutter release can be locked down by turning whilst pressed (this feature unlocks the frame counter sprocket for winding the film back). 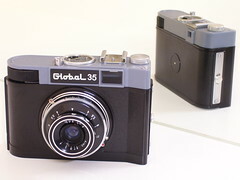 The camera has a self-timer and a cocking mechanism that is not integrated into the film advance wheel. 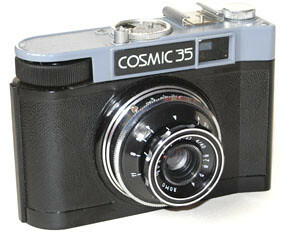 The Smena 8 was also sold as the Cosmic 35 and the Global 35 in English-speaking countries. A further version of the Smena 8 was the Smena 9, which just had the self-timer deleted (it was basically the Smena 7 with film rewind knob added). Smena 8 "Great October 50"